1) The cam sensor has nothing to do with ignition timing. That is controlled by the chip. It locates cylinder #6 so that both injector pulse and ignition spark will be on the correct cylinders. 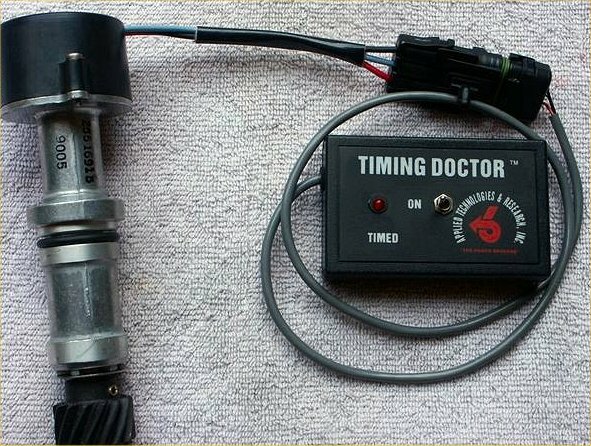 Rotating it like a distributor does not affect actual spark timing. It is either right, or it is wrong. 2) If you have bought the Casper's replacement cap with the led in the top. Use the instructions that came with it instead of the below. This method is proposed by Chuck Leeper of Cody Motorsports. It uses the Caspers Cam sensor tool rather than a volt meter but the technique is valid for either. Take a piece of masking tape and make two marks 1.45" apart. 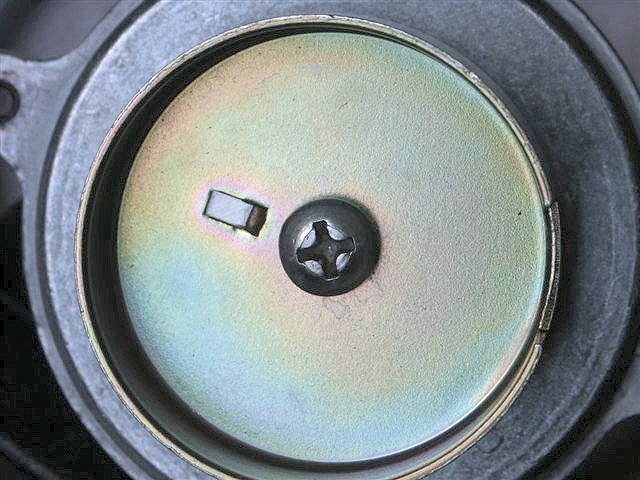 Go to the harmonic balancer and position one mark on the top dead center notch with the other mark positioned counterclockwise from the first. This corresponds to 25 degrees ATDC. Make a mark on the balancer at this point. Turn the crankshaft on clockwise until this mark lines up with the pointer. Note, it is important that the crank is on Top Dead Center and then 25 degrees past TDC. Remember that the cam turns at half the speed of the crankshaft and merely turning the crank until the point lines up with the pointer only assures you a 50% chance of being correctly on the 25 deg TDC mark. TDC is found when the notch on the balancer lines up with the timing pointer on the cover and both valves on cylinder # 1 are closed (Number 1 plug is the front plug on the drivers side). In order to not have to pull the valve cover, I remove the spark plug and start turning the crank clockwise until I feel a puff of air come out the plug hole. This will be the compression stroke and I then continue turning the crank until I reach the 25 ATDC point. If you don't get this right, you will not like the way it runs as it will be spraying fuel 180 degs out of phase. Take the camshaft positioning sensor and turn the gear until the dot on the gear is aimed toward the passenger fender when the the wires on the cap are pointed toward the driver's side headlight. Install the sensor into its hole. It helps to lube the O-ring a bit so the sensor will slide into place. 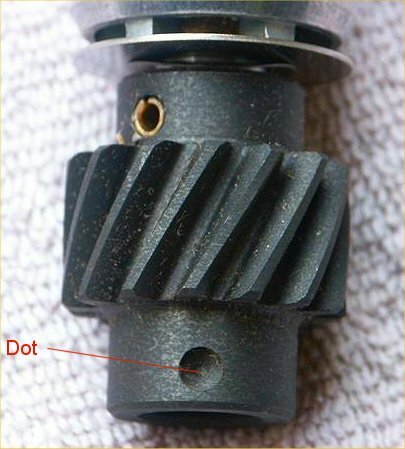 Note that as the sensor is inserted, the gear on the bottom will mesh with the gear on the cam and then the end of the sensor drive must line up with the end of the oil pump drive shaft. 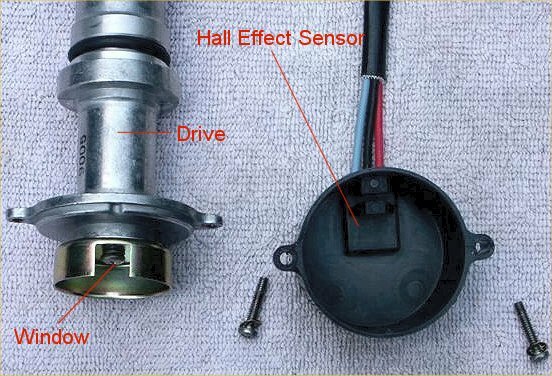 If the shaft and the sensor drive don't line up correctly, the sensor will not go all the way down. If you felt the two gears mesh, just bump the engine over while gently holding the sensor down. When the sensor turns enough to line up with the drive shaft, it will drop down into place. Install the hold down leaving the sensor just loose enough to rotate when you turn it with your hand. Using the Casper's cam sensor tool, plug it into the cam sensor harness. Turn the cam sensor clockwise until the LED on the tool goes out, then turn the sensor counterclockwise until the LED comes back on. I suggest turning the sensor about 1/8" to 1/4" further CCW from this point before tightening the hold down clamp. The LED should still be lit, however*. If you don't have Casper's tool, Here is a method of adjustment using your volt meter. Also, at the bottom of the page will be a picture from the factory manual on using a voltmeter. For an in depth discussion of the cam sensor function, go Here. *Rotating the sensor CCW after the initial setting point may be folklore, but, many have found it to make cars with larger than stock cams run a bit better and reduce the tendency toward detonation. The theoretical guys say it cannot help...but, I have seen it more than once so I do it on my cars. Lately, I have seen it fix part throttle, low boost miss problems in cases where the vertical play in the shaft was causing the reluctor window to get out of synch with the fuel timing window. The correct way to fix this problem, obviously, would be to reduce the vertical play in the shaft. The following pictures were provided courtesy of Chuck Leeper, Cody MotorSports. This picture shows the cam sensor drive and cap assembled with the Cam Tool plugged in. This one is from ATR. Dot goes toward the passenger side fender when inserting drive assembly. Remember, engine must be sitting at 25 degs ATDC! Window will be pointing toward the drivers side fender when inserting drive. Top view of drive assembly. The wheel must be pinned into place so that it cannot rotate versus the drive gear. If the wheel moves, it will screw up the fuel timing and the car may not start, or, it will run very badly. Voltmeter procedure from the shop manual below.